The Swingline EX10-06 Cross-cut Executive Shredder offers intelligent Jam Free technology to eliminate frustrating and time wasting paper jams. The EX10-06 Cross-cuts up to 14 sheets and makes quick work of staples, paper clips and credit cards. The EX10-06 has a 6 gallon waste capacity and includes ultra-quiet operation and easy-to-use controls. Perfect for confidential and strategic documents, the EX10-06 provides a security level 3; ample protection for the disposal of your sensitive documents. Swingline is new to the document shredder market, however will soon be known for manufacturing high quality shredders that can help protect your identity and comply with privacy laws. Swingline offers a generous 2-year warranty on machines and lifetime warranty on cutters. Top quality for years of service! This is an excellent little shredder at 10 pages/pass. It is very convenient to have the "drawer" to pull out and empty. A lot better than having to lift off the head to empty. We purchased this shredder because the "Level 3" shreds still had readable fragments in it. We've used this one for about 3 loads now and it's working really well so far. The shreds are not readable and effectively impossible to piece together, so very sufficiently secure for any personal use. We try not to put 6 sheets through at once because it makes heavy work of that, and are oiling it as recommended every full bin. When you remove the bin, it's a little tricky to get back in and you have to push on both sides. Overall, the construction of the plastic is a bit flimsy but the mechanism seems to work fine. A lot better than my former shredder, where you had to lift the top off. Welcome to MyBinding video. This is a demonstration of the Swingline EX 10-06, a cross-cut executive shredder. Simple, effective, and stylish, the EX 10-06 is a great shredder. Here's how it works step-by-step. Turn the whole unit on with the power switch that's on the back. The power switch on the front is how you begin your current project. The only other buttons are forward and reverse. Turn it on, green light means automatic form is ready, and insert your papers; the EX 10-06 will take it from here. Covers, papers, credit cards and the like can all be used on the EX 10-06. The opening and the motor can handle up to ten sheets of 20lb paper. The Jam Free Technology allows for some awkward or oversize documents to also be shredded. Should you need to reverse the motors, simply press the REV reverse button and the project will come back out, pull it out with your hand. The shreds fall into the waste basket just below. And that's it with the EX 10-06 by Swingline. For more demos and reviews of this product and many more, check out MyBinding.com. Transcript: Welcome to MyBinding video. 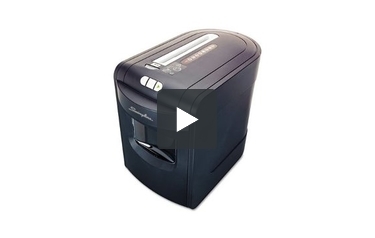 This video reviews the Swingline EX 10-06, a cross-cut executive shredder. The EX 10-06 is simple, stylish, and effective. Here's how it works step-by-step as we look at its features. Welcome to MyBinding video. This video reviews the Swingline EX 10-06, a cross-cut executive shredder. The EX 10-06 is simple, stylish, and effective. We really like just how simple the machine is with an on and off switch in the back and an auto-feed in the front. Push the auto button, it will take it forward. There's also a forward and reverse button on your own command as needed. The EX 10-06 provides a security level 3, ample protection for the disposal of your sensitive materials. And it all falls into a six-gallon waste bin just below the shredder. And it's thin, compact enough to fit under almost any desk. The automatic feed sensor seems to work well enough without much jiggling. It can shred seven feet per minute, 8.5" x 11" documents, and it can run 20 minutes before a cool down period is needed. The EX 10-06 claims to shred up to 14 sheets at a time, however we found that ten was really about all we could get into the slot. It can shred credit cards, but not CDs. It does have a Jam Free Technology that allows some oversize or awkward documents still to be shredded without problem. However, should you run into a jam and for some reason need to reverse everything, you can simply hit the reverse button and the rollers will go backwards; you can remove your document and do as you please. Overall, we like the simplicity and the effectiveness of this level three cross cut shredder. Our price point is just under $175 and it seems like a great buy. For more reviews and demos of this product and many more, check out MyBinding.com. The EX10-06 is a good choice if you need to shred confidential documents like bank statements and old tax returns. This machine is a Level 3 cross-cut shredder, so you can be sure that your information will be safe. The device can also shred credit and debit cards. 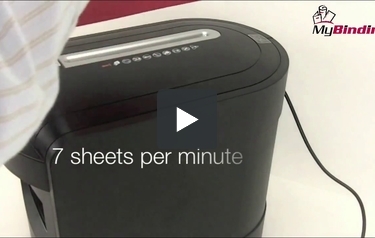 This device can shred up to 12 sheets at a time. A 12-sheet shredding capacity is pretty impressive for a cross-cut shredder. The machine can shred continuously for up to 20 minutes, so it will help you dispose of your documents pretty quickly. Best of all, the shredder offers jam-free performance to making disposing your paper hassle-free. The EX10-06 operates quietly so you can use it in a shared work area and not bother your colleagues. You can even share this device with other since it has a 6-gallon waste bin. When the bin gets full, just pull it out like a drawer and recycle your shreds. If you don't have a lot of room in your work area, this machine is a good choice. It's small enough to fit under your desk so you can save space and be able to shred without leaving your desk. Overall, this shredder is easy to use. It even has a user-friendly control panel for your convenience. Finally, the EX10-06 comes with great warranty coverage. The cutters are backed by a lifetime warranty and the rest of the shredder is covered for two years. Since the EX10-06 has a 12-sheet shredding capacity, it might not be a good choice if you need to shred large amounts of paper at once on a regular basis. Also, this machine can't shred CD's or floppy disks. If you need to shred those kinds of items, you'll need a multimedia shredder. If you shred continuously for 20 minutes, you'll need to let the machine cool off for 15 minutes before you can continue. This might be an issue if you're in a hurry. The EX10-06 is a smaller shredder, so it doesn't come equipped with an automatic oiler. However, oiling the machine by hand is incredibly easy and it doesn't take long. Since the Swingline EX10-06 is a small shredder, it's not surprising that it has a few weaknesses. The weaknesses (relatively low shredding capacity, a 15-minute cool-down time, etc.) are pretty typical for a device such as this but they definitely don't overshadow the machine's many strengths. For example, this machine offers a good level of security and it operates quietly, making it ideal for shared work areas. Also, this device is easy to use and it's small enough to fit under a desk. And the warranty coverage is excellent. All in all, the EX10-06 is a solid cross-cut shredder from Swingline that's a good choice for office use. Shred Size 1/4" x 2" 1/8" x 1/2" 3/16" x 1 1/2"